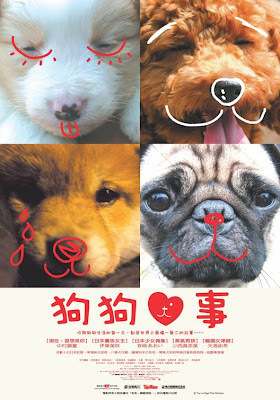 Also Known As: "Inu no eiga"
"All About My Dog" is Japanese movie made up of a compilation of short stories. We have the DVD at home and my favorite stories are the ones about the Shiba Inu, Pochi and another one about a girl named Mika and her dog, Marimo, both are tear jerkers. Unfortunately. the other stories are rather crappy, like the one made into a musical and another one about a dog's infatuation. Aunty Esther sent me a You Tube link to the entire Marimo short film with English Subtitles, so I thought of sharing it with you all today. It is almost 11 minutes long, but definitely worth watching. The music is beautiful too! Please be warned that this one has a cry factor of 10, so watch with caution. Please give all your doggies a scratchie and big hug today! I watched this video some time ago & cried like a silly dog! I cried again watching this but not as much as the last time. Hee! I would love to get the DVD!!! Well, the movies itself sounds nice! you have to ask your mummy to watch 10 promises to my dog, another jap movie by the same guys that brought us Quill... confirm she will flood the cinema.... I cried so bad in the cinema but it's ok, because everyone around me, including a hunky looking male neighbour was sniffling too... seeing the show made me miss you loads! take care and keep it cool!